This product is a full Bunion Corrector and Bunion Relief Sleeves Kit, including 9 pcs designed to relieve pain in the Bunion area, and give back to your feet a normal look. All the products in this package are made out of high grade medical material, and are designed to effectively act on your Big Toe problems without causing pain or discomfort. They fit most, and can stretch for bigger feet size without causing discomfort as well. 9 PCS BUNION RELIEF KIT : Designed to reduce the pain caused by bunion, this 9pcs kit includes x8 Toe Separators, x1 Spacer Straighteners for Splint Aid Surgery. All of this corrector are made of high medical grade material and silicone that will effectivily relieve pain when using them. One size fits most. IMPROVES FEET HEALH : It is with the help of there medical grade product that your Bunion will stop causing problems. This products can relieve pain and correct your foot problems such as big toe joint pain, tailors bunion, Hallux Valgus and others. QUALITY PRODUCT : Constructed from a high quality medical grade silicone, the 8 toe separators are designed with a 3 point pressure system to effectively target the most painful area. They will maintain your toes to a normal position so that the bones can reajuste by themself. The Strap produce a pull that will force the big toes to straight back and go back to there normal position. 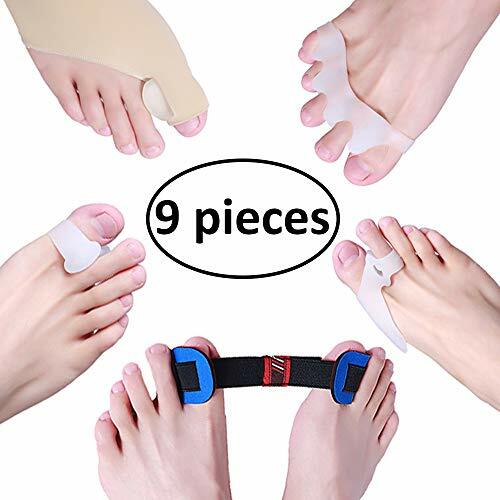 FITS MOST FEET : Made out of stretchable silicone, the toe separators will fit most feet sizes, and will extend if your foot doesn't fit the original size. The silicone separators can stretch to a certain extent without being to tight and cause pain. The Strap as big openings for both big toes, and will fit most, or can also stretch to fit the toes. HOLD IN PLACE : This separators, as well as the strap are non slippery product that will not move during use. The toe separators can be used in your shoes during you day without any risk of changing position, or even falling off if used at home without shoes. The strap can extend and will not break to a certain point. If you have any questions about this product by LANGFON, contact us by completing and submitting the form below. If you are looking for a specif part number, please include it with your message.